Alongside the 2018 Enduro, Specialized revealed its new WU dropper post back in August last year. 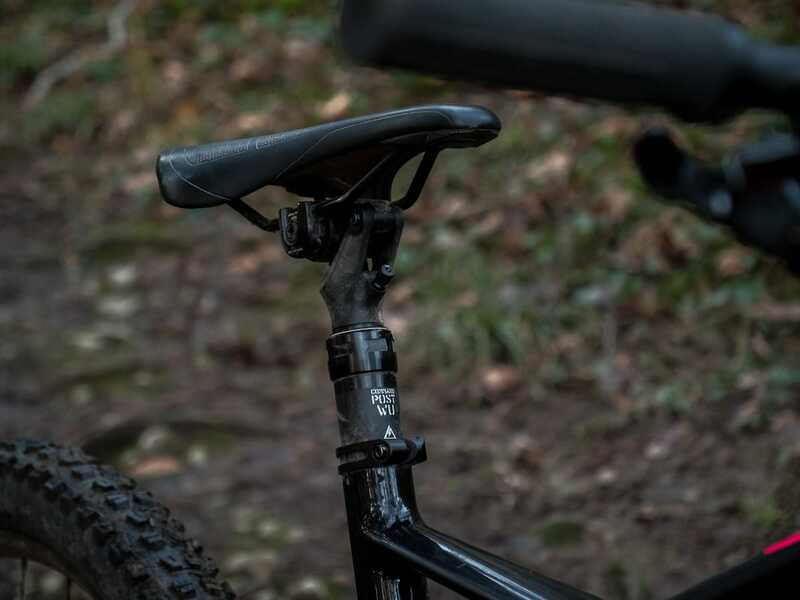 Using a 34.9mm diameter to fit all the gubbins inside, the WU dropper and its tilting saddle clamp is unlike anything anything on the market. To test it out, we sent a new Enduro and a WU dropper post up to one of our most rapid test riders, Ben Gerrish. As a handy rider – with or without a race plate – Ben has been testing his WU on the demanding trails in the Lake District. Over to Ben! 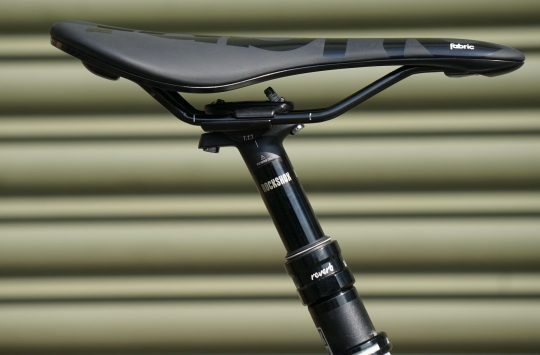 Specialized’s new Command WU is unlike any other dropper post on the market. From a distance of about two metres though, most of them look the same. And once sat astride them on the bike, fundamentally they all aim to do a similar job. Don’t get me wrong, I am an avid fan of the dropper post. I won’t delve too deep into my opinions but you can’t argue, they’re essential to the game these days. But is the market over saturated with multiples of the same product? Specialized clearly thought so. And all evidence points to the fact they’ve been planning this move for a while now. The WU is only available in a huge 34.9mm diameter – specifically for 2017 and 2018 Specialized Enduro frames. I present to you the Command Post WU. ‘WU‘ being a downhillers term for a significantly tilted saddle. From two metres away the WU post looks like a scaled up design of the original Command post (which will continue to be available. You can read our separate review here). It’s black, it has a neatly machined aluminium lever, and an intricate looking seat rail clamp. As has become the norm on modern posts, it comes with a stealth routed cable. You quickly notice the girth of the thing. A giant 34.9mm, which although too large for the majority [Ed: 99.8% we’d reckon] of frames, shows Specialized’s long thought out intentions. 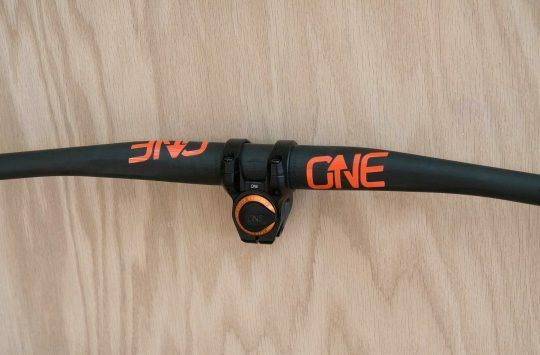 The 2017 Enduro frame actually featured this 34.9mm internal diameter for its seat tube, though all of those 2017 models came spec’d with the regular Command Post, with a specifically machined shim to suit. This had caused whispers amongst Specialized dealers and enthusiasts, but I’m not sure how many people expected the WU to fill the gap. A second stanchion allows the saddle to hinge backwards, increasing the effective drop. The real stand out features of this post really come once you climb aboard. You may be surprised to realise that the WU has a staggering, wait for it… 115mm of travel. But, luckily there is more, with a second stanchion that sits inside the main seat tube allowing an extra 35mm of travel in the back half of the saddle, not only giving you an effective drop of 150mm, but also tilting the nose up by 14° in the process. This gives you the WU saddle position to more aggressively attack the steeper descents of your ride, and at the flick of the switch, return to your full height and regular saddle position for pedalling. 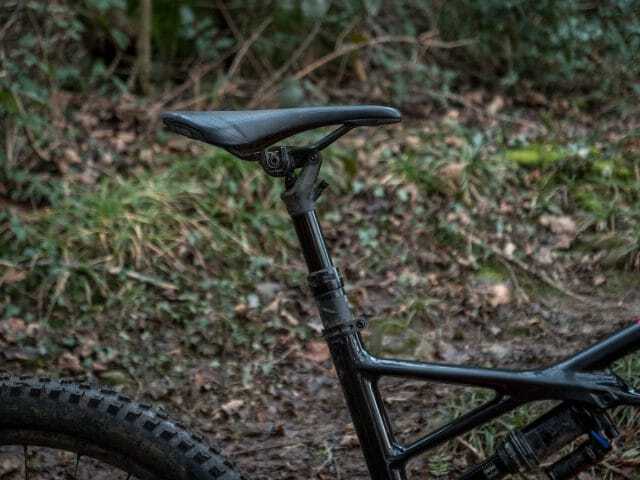 The advantages of these features are tried and tested, as downhillers and dirt jumpers have ridden a more aggressive seat angle for years. The idea is to provide you some added control with your knees on the saddle, while keeping the bulk of the saddle out of the way so you can push your arse back further and lower. The rotation in the saddle can also create a roll in your hips producing a stronger stance on the bike. This, combined with an instant return to whatever angle you choose to pedal could – in theory – give you the best of both worlds. The SRL remote is the same, and remains as one of the best dropper remotes on the market. Fitting the WU was simple enough. Once the cable was routed into the frame, a simple barrel with a grub screw held the cable secure and fit snugly into the hook on the post. That said, our much preferred routing method is to have the cable head at the base of the post, and the grub screw up at the lever, so it’s a shame to see that Specialized has gone the old-fashioned route. The saddle rail clamp is satisfyingly easy to use, as the two side plates come off and on easily, so you don’t have the rail, clamp, Allen key juggling game you do with some other posts. The saddle clamp is simple. Internally, the WU dropper is not dissimilar to the existing Command IRcc dropper, which is a good thing. That means there’s an adjustable air spring, with the valve located just underneath the nose of the saddle. Return speed can be adjusted via the schrader valve (15-20psi) and varies from quick to lightening fast. 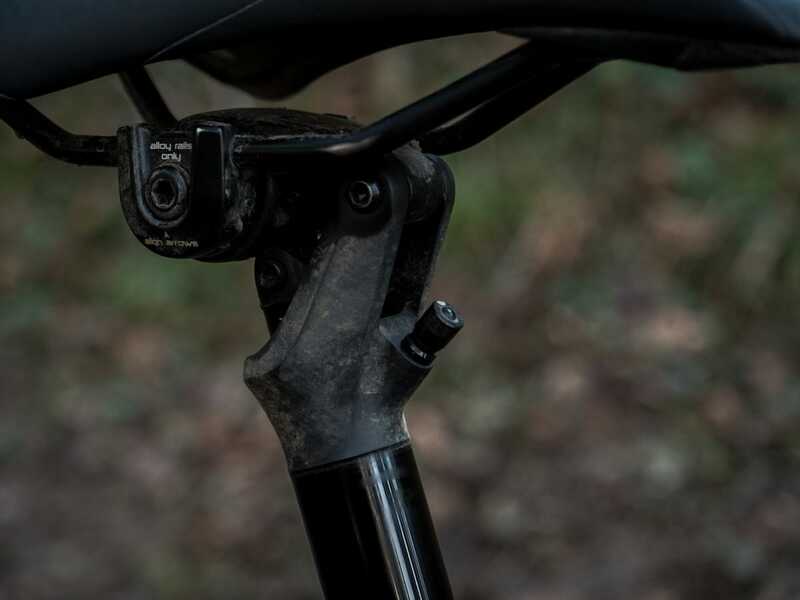 Rather than a hydraulic floating piston, Specialized uses a durable mechanical locking system to secure the post in place. The Cruise Control system has been updated to house a 14 point stop, with these 14 points positioned between 25mm and 100mm of drop. Set the air pressure between 15-20psi to adjust return speed. The actuation of the post up and down has felt solid throughout a month of pretty intensive testing, and still seems to be running smooth. There is the standard minimal dropper wobble within the post, but this appears to be a necessary evil of any adjustable post. It has not become an issue in the time I’ve been riding the post, but it will be interesting to see whether there winds up being more play after another 12 months of use. Expect an update down the line on longer term durability. 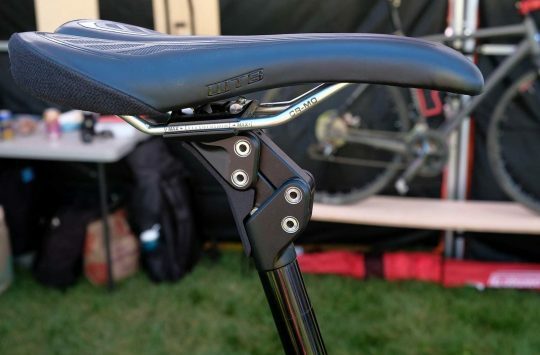 Having more recently run a neutral positioned saddle, it was a novel experience to have the more aggressive tilted position on the saddle on my trail bike. As advertised, the upwards nose position does give your thighs something to grab onto and guide the bike when required, though this is likely to be more useful for Coastal Crew-types that like to throw shapes in the air over enormous doubles and tabletops. On the mega steep stuff, the dropped tail noticeably reduces the chance of catching your shorts as you move forwards and backwards over the saddle. In the middle height, the tilted saddle creates some issues. I did however, find issue with the tilting action, especially when the Specialized brand saddle was coated with a layer of fine British mud. While using the semi-dropped position that I sometimes assume in more technical pedalling sections, the WU left me hanging on tight to prevent my arse from slipping off the back of the slippery saddle. I guess that’s a small price to pay for the full-on downhill experience. On that same note, with the raised nose not hitting much drop at all, even with the effective 150mm drop at the rear it doesn’t seem quite enough. On the large Enduro I was riding it just didn’t feel like it was entirely out of the way at times. Novel action aside, I still can’t help but feel that Specialized would have just been better off using the 34.9mm diameter to make a bombproof 150-175mm dropper. 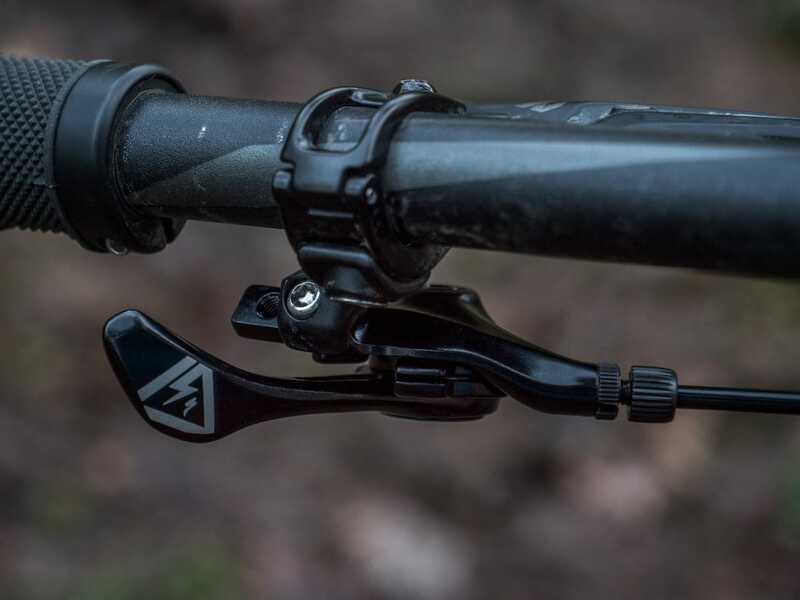 That said, not everyone is running enough seatpost to be able to run such a long-stroke dropper post, and this is where the WU dropper provides an advantage over all droppers. 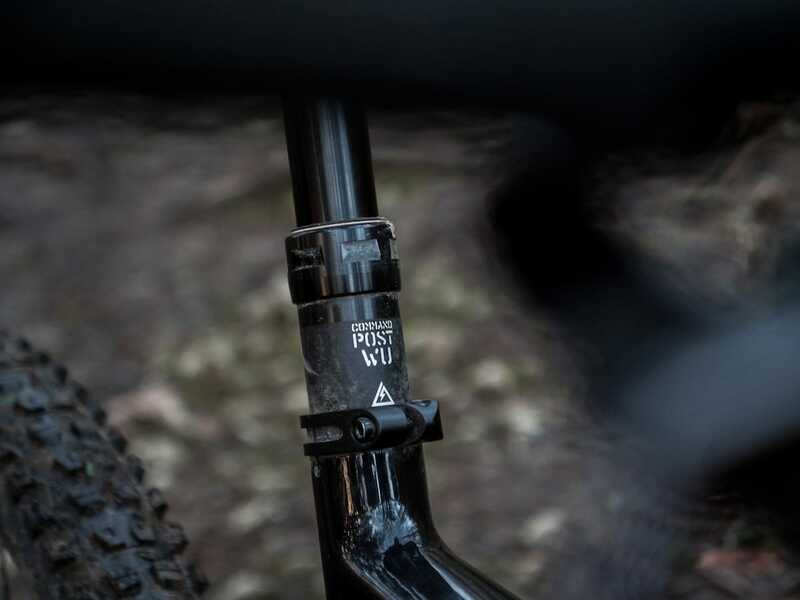 For riders who are perhaps on a larger-sized frame, or simply those with shorter legs, the WU will provide you that 150mm of effective drop, but with a shorter overall seatpost length. 650g doesn’t bring the WU in at the lightest in the field, but chances are if this is the one for you you’re going to be firmly planted in the gravity end of things and it will be a small sacrifice for the desired performance. The price of £400 also sits in the upper tier for similar products, but again, you’re paying for design, development and the desired performance. The engineering is impressive, but can Specialized just make a 150-175mm travel dropper? 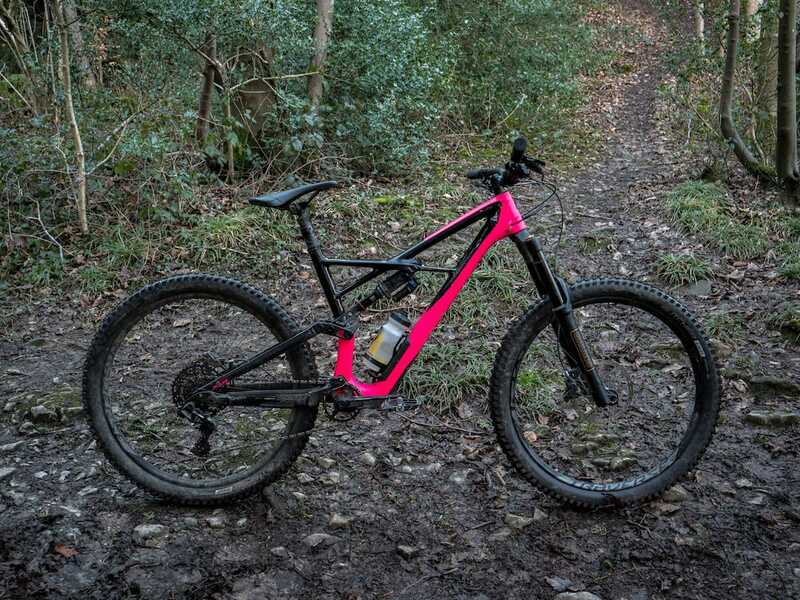 All in all, hats off to Specialized for pushing the boat out and creating something fresh in a sea of ‘same, but different’ products. I’m intrigued to see how it holds out to further use and abuse, but currently super impressed with the action and engineering. The design will most definitely appeal to riders of a certain ilk, but I’m not sure it would ever be the go-to across the board. 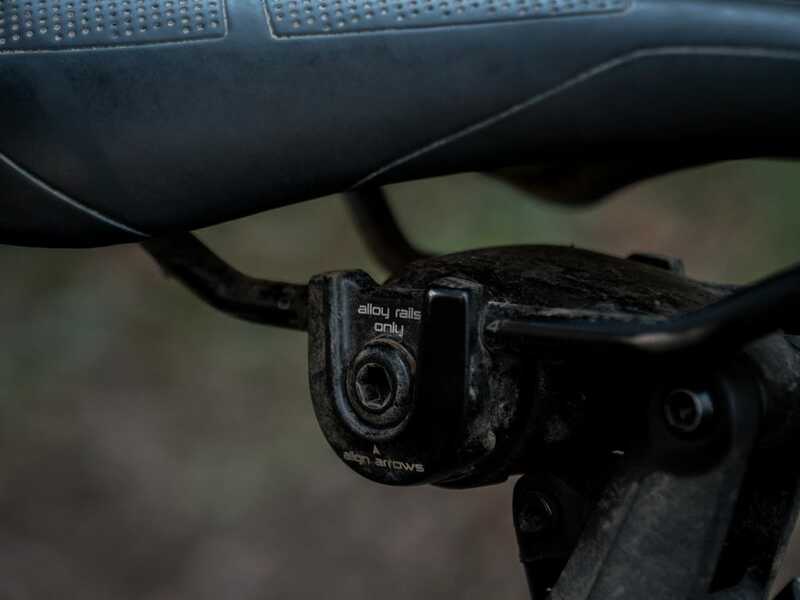 Then again, the 34.9mm diameter means that – save for a couple of older XC models from Scott – the WU dropper is only going to be an option for those who own a 2017 or 2018 Enduro anyway. 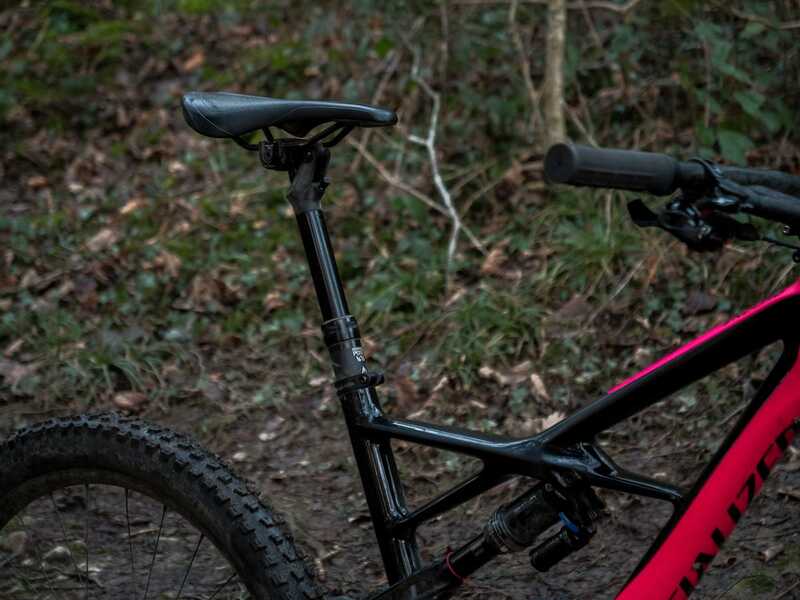 When it comes to the steep and fast downhills, the effective 150mm drop at the rear of the saddle comes into its element. 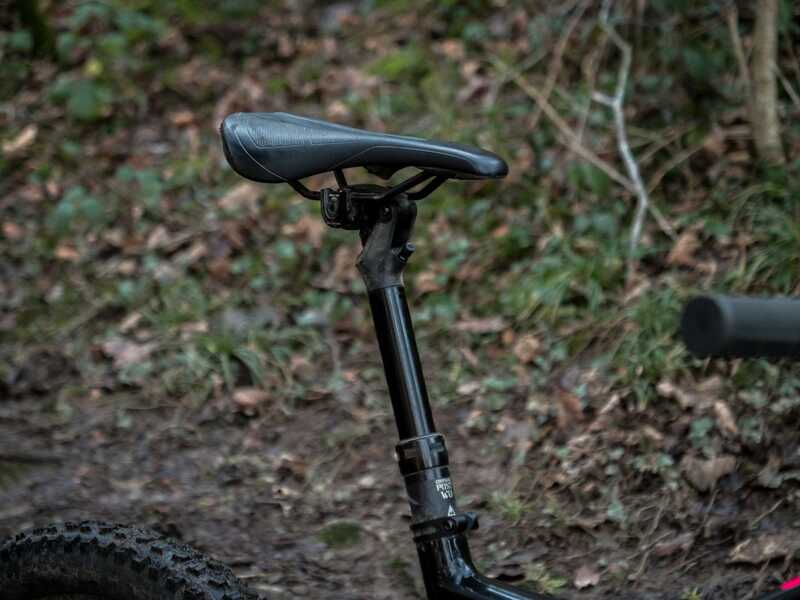 Unfortunately on less steep trails when a half-dropped position is required, the off-kilter saddle angle just doesn’t provide the best solution for pedalling. Ultimately this means the WU is going to be suited to the rider that’s dedicated to fireroad climbs followed by intense trails, and not the technical all round trail rider. 9point8 thank you. Problems solved.